Brussels, Antwerp, Ghent, Bruges, Luxembourg, and more! The Kingdom of Belgium is home to world-famous chocolates, diamonds and a very open gay lifestyle. Bruges canals, Antwerp fashion, decadent chocolate, mussels and chips, belfries and castles, crazy carnivals, Tintin and Trappist beers... how could anyone call Belgium boring?! Belgium's biggest draws are its medieval town cores, home to a bounty of Unesco sites and many a delightful cafe-bar serving some of the planet's finest beers. But there's so much more, from stalactite-filled caves to post-industrial heritage, forest-edged kayaking rivers and rural chateaux to sandy North Sea beaches. 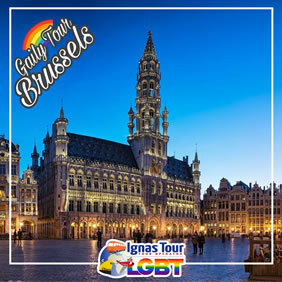 • Buffet Breakfast and meeting with your LGBT Friendly Tour Guide to enjoy a special walking tour of Brussels. • Discover the spectacular landmarks and monuments of Brussels with our Gay/Lesbian Guide. 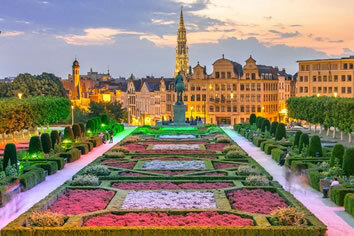 • Start your walking tour from the Park of Brussels, where you’ll find the Royal Palace. •Continue to the Place Royale, an historic square with a beautiful statue. Walk to the Meeting Center and Mont des Arts with its gigantic clock (or carillon) and bells. The clock is surrounded by twelve historical figures from Belgian history and perched above it is a bourgeois figure, the Jacquemart, who rings a large bell. • Explore the Cathedral of St. Michael and St. Gudula. Then reach and observe the medieval majesty of the Market Square and take a look to the remarkable façade of the City Hall. • Enjoy a fantastic chocolate tasting before finally arriving at the small, bronze statue/fountain of a little boy peeing, Mannequin Pis, which has become a national landmark. • Dinner on your own and overnight at your hotel in Brussels. • Buffet Breakfast and departure to Leuven. • Explore the city of Leuven on your own. This is the oldest university city in Belgium and is home to one of Europe’s oldest universities (KU Leuven), founded in 1425. The university, one of the most important in Europe, has its roots in the center of Leuven, and its historic college buildings dominate many of the squares and streets. Admire the Town Hall which is one of the best-known Gothic town halls worldwide. • Once arrived visit this small and picturesque city that has a rich history. Walk around and visit the Market Square, the Saint Rumbold’s Tower (outside) and walk through the peaceful beguinage. 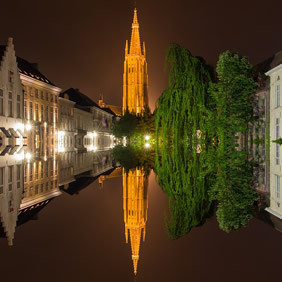 • Dinner on your own and overnight at your hotel in Antwerp. 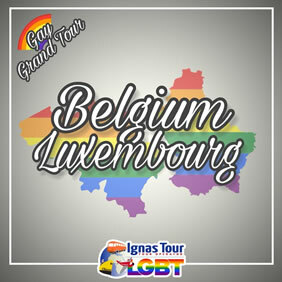 • Buffet Breakfast and be ready for an amazing LGBT Friendly Tour of Antwerp. • Explore the historical center of Antwerp, starting from the ‘Vlaeykensgang’, a medieval quarter full of narrow streets and blind alleys. • Next we visit the main square, the old Market Place (the Grote Markt). The Brabo fountain, the Renaissance City Hall and the 16th and 17th century guild houses catch the eye. • Stop and visit of Saint Mary’s Cathedral. This magnificent Gothic church has great pieces of art by a.o. P.P. Rubens and other Flemish masters. • Via the Groenplaats we walk towards the Meir (Antwerp’s main shopping street) and pass some landmarks put on the international fashion map by the Antwerp Six. On our way we pass by at the ‘Rubenshuis', for twenty five years the house and atelier of the Baroque painter Pieter Paul Rubens. • Continue your walking tour over the Keyserlei towards the Central Train. Due to its late 19th century eclectic style the building is dubbed ‘The Railway Cathedral’ by Antwerp’s inhabitants. • Buffet Breakfast and departure to Ghent. • Once arrived enjoy a LGBT Friendly walking tour along the picturesque Graslei and Korenlei. The gables of their guild houses turn them undoubtedly into two of Ghent’s most beautiful historical streets. • From one of the flanking bridges, one can see the postcard panorama of the three towers: the belfry and the steeples of the St. Nicolas church and the St Bavo’s cathedral. • A stroll over the Korenmarkt, a stop at a.o. the St Nicolas church, the impressive belfry and its cloth hall (both on the World Heritage list) brings us to the cathedral. There the famous altarpiece The Adoration of the Mystic Lamb (1432) by the van Eyck brothers, a milestone in art history, is not to be missed! • On our way to the Vrijdagsmarkt we elaborate the City Hall with its mixture of styles from flamboyant Gothic to sober Renaissance. In the middle of the Vrijdagsmarkt Square we stop at the statue of Jacob Van Artevelde. He sees to it that Ghent thrives again like it did in the 14th century when Jacob ended the English boycott on wool imports. A little further we encounter Dulle Griet (“ Evil woman”), a 15th century cast iron cannon, weighing more than twelve tons. • Once we have crossed the Lys we enter the inner courtyard of the House of Alijn. This former almshouse is now the Museum of Folklore. The exquisite complex is part of the Paterhol. The only neighborhood in Ghent where the original medieval street plan is still intact. • Through winding alleys and cobbled streets with numerous restaurants we reach the Castle of the Counts. This imposing fortress used to be the residence of the count of Flanders. Later on it was used as a courthouse, a jail and even a textile factory. • We return to the Korenlei passing the St-Veerle square and the Old Fish Market. • Afternoon free time in Ghent for individual visits and shopping. • Then continue to Bruges. • Dinner on your own and overnight at your hotel in Bruges. 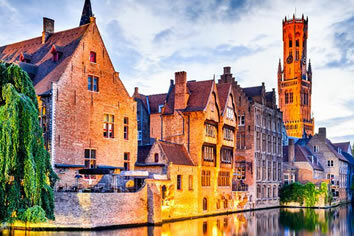 • Buffet Breakfast and enjoy a very special LGBT guided Tour of the romantic city of Bruges. • With its almost intact medieval street plan Bruges is certainly an evocative open air museum. But having survived the two World Wars unscathed it luckily preserved all its art treasures and museums. • During this half day city tour we discover the main highlights of Bruges. • The city is also proud to be called the “chocolate capital of Belgium”. Since the 16th century chocolate is produced in Bruges. Nowadays the city center counts more than 50 chocolate manufacturers, every year a Chocolate Festival takes place in the city and on top of that the city has its own chocolate museum ‘Chocostory’ which attracts many visitors. During our discovery walk we will pass by at some of the finest chocolate shops where you will assist to a chocolate demonstration and have a delicious chocolate tasting. • Our guide will show your clients the most important and most beautiful buildings and places such as the Market Square with the Belfry, the Burg Square with Town Hall, the fish market, the Dijver, Our Lady Church and the beguinage. • At the end of the morning we will visit the brewery De Halve Maan where the Brugse Zot beer is being brewed. A local guide will tell your clients everything about hops and malt. • Afternoon free time in Bruges for individual visits and shopping. Dinner on your own. Overnight. • Buffet Breakfast and departure to Damme, driving along the historical canal Damse vaart, which was digged by order of Napoleon. We make stroll through the lovely center of the historical village of Damme known for the legend of Tijl Uilenspigel and a popular nowadays due to its many charming restaurants and its antique and book shops. • After Damme we proceed to the coast and visit Knokke and by coach we drive along the numerous villas of Belgium's most mundane beach town. • Passing by at Zeebrugge, together with Antwerp one of the most important container harbours in Europe. • Brief stop in the seaside resort De Haan where we discover famous for its numerous buildings in Belle Epoque Style (late 19th, early 20th century). The Belgian king Leopold II was also closely involved in the growth of this seaside resort and famous people such as Einstein stayed there. • Then continue to Oostende, the most popular beach town along the Belgian coast. The beautiful sandy beaches, the fish and yacht harbour and the fish market are some of its major attractions. • After a stroll along the harbour and the diken, transfer to Brussels. • Dinner on your own. Overnight at your hotel in Brussels. •Buffet Breakfast and excursion to Luxembourg. 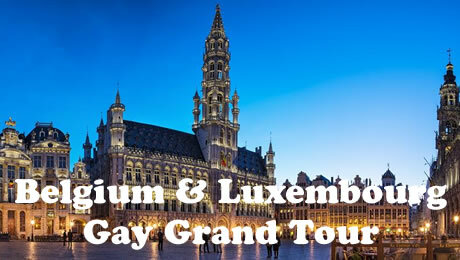 • Explore this amazing city together with our LGBT Tour Guide, a Unesco world heritage city, by the upper part of the town by walking along the Place des Armes, the Place Guillaume II, the Cathedral and the monument in honor of the Grand-Duchesse Charlotte, and the palace of the Grand-Duke. • Along the famous 3 Towers gate we reach the casemates of the Bock, an impressive system of tunnels made in the rocks. 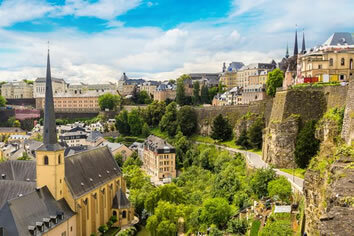 • After visiting the casemates, we descend toward the lower city and visit the plateau of Kirchberg with its European Buildings and institutions, the abbey of Neumünster, the Wenceslas Wall. • Transfer back to Brussels. • Breakfast in the hotel and transfer to the Brussels airport. Floris Hotel Arlequin Grand Placeis situated in a pedestrian area, 200 m from Grand Place. The breakfast restaurant on the 7th floor offers unique views of the surrounding area. Guests receive a free map of Brussels and can make free use of Floris Hotel Arlequin's fitness centre. The Manneken Pis statue is a 5-minute walk away and you can reach the De Brouckère metro station in a 2-minute walk. All guest rooms of Floris Hotel Arlequin Grand Place are air-conditioned and have a flat-screen TV. Guests benefit from free WiFi throughout the hotel. Breakfast restaurant 7th Heaven serves a continental breakfast buffet, which you can enjoy while looking out over the lively streets, churches and roof tops. Snacks and drinks are on offer in the Floris Bar. A work desk comes as standard in the rooms at Century Hotel. Each of the guest rooms also has a private bathroom. An extensive buffet breakfast is served each morning. The Curnonsky Restaurant serves modern cuisine in the dining room which boasts views of the Art Nouveau station front. Guests can also enjoy a local Belgian beer in the bar. Hotel Century is only 200 m from Antwerp Zoo. The Centraal tram stop is just over 100 m away and provides a direct service to the historic centre in 5 minutes. The Keyserlei and Meir shopping areas are less than a 5-minute walk away. This family-run hotel is housed in an 18th-century former brewery in the historic centre of Bruges. Maraboe features free Wi-Fi and wellness facilities, only 700 m from the Grote Markt. Hotel Maraboe offers sound-proofed rooms with satellite TV and a work desk. Guests can enjoy a daily Continental breakfast including fresh fruit, cereals and boiled or fried eggs. The leisure facilities include a sauna with showers, solarium and a gym in the old cellar. There is also a reading room with a computer and comfortable chairs. Brugge Railway Station is less than 15 minutes’ walk from the hotel. The Beguinage and Halve Maan Brewery are both only a 10-minute walk from Maraboe Hotel. The hotel has its own taxi service.